Worcester, Massachusetts, June 14, 2011 –– Curtis Industries has introduced a line of Sno-Pro front end loader plow blades which offer major advantages over bucket plowing. Designed for snow removal and general purpose use, Sno-Pro blades are ideal for pushing snow, aggregate materials, livestock feed, and silage. 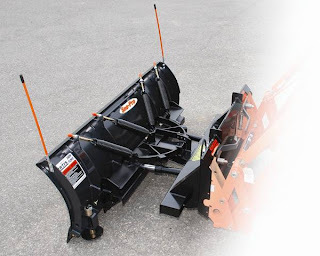 Built tough for farmers, landscapers, ranchers, construction companies and homeowners these unique implements give an added versatility to your bucket loader. Curtis Industries, LLC is the leading manufacturer of cabs, enclosures and accessories for compact tractors, golf cars, and utility vehicles. The company, which started in 1968, also manufactures truck plows and snow and ice control equipment for tractors and utility vehicles. Curtis Industries, LLC markets its products exclusively through a large network of dealers in the United States and Canada as well as Japan, Korea and Western Europe. The company operates from a modern 150,000 sq. ft. facility in Worcester, MA. For more information on Curtis products please visit www.curtisindustries.net or call 800.343.7676.